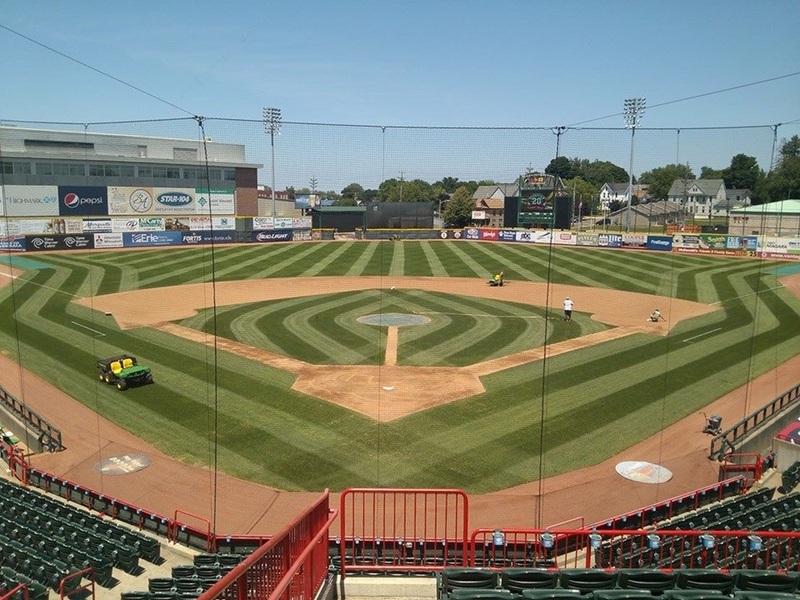 The 20th season here at Jerry Uht Park has come to an end, but the work has not stopped. We have Gannon University fall practices going on now and once they finish, we will be starting to put the field to bed for the winter. 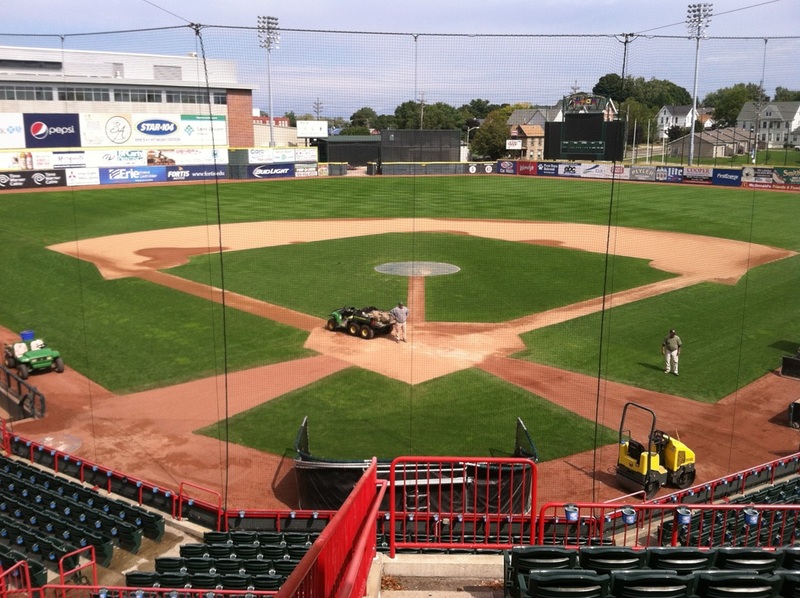 Some of the normal fall jobs have already been completed such as resodding worn areas, aerating and adding clay to low areas on the infield dirt. We also made a change in the look of the field this year making walkways from the warning track to homeplate. This not only gives the field a new look, but it also will help wear and tear in those areas due to foot traffic making my job a little easier. The start of this season was one of the most difficult in my 16 seasons on the groundscrew. With the late snowfall and deep frost which was measured to be around 3’ deep, it caused the grass to stay dormant a few weeks longer than average. Not only did this cause the grass to start growing later, but it also pushed us back a month to roll, aerate and topdress the field. The first five weeks of the season the grass was not growing enough to cut, so we had to roll the patterns in with the mower. Because the grass wasn’t growing, we were developing worn areas that would not fill in causing issues with the play of the ball. Once the weather turned for the better, reseeding and our fertilization program brought us back to a nice thick turf. Once we are finished with everything at the ballpark, I switch gears and come over to Erie Insurance Arena to start with the other side of my job here with the Authority. This is the start of my fourth season in charge of sport surfaces for the other teams that play in the arena. For the Erie Otters, this job includes inspecting thickness and temperature of the ice on game days to make sure it is accurate. I also make sure the edging along the dashers is completed. When the ice is covered, my priorities shift to the basketball floor for the Erie Bayhawks. I walk the basketball floor each day with two of my part timers that also work for me at the ballpark. We check for breaks and cracks that could affect the bounce of the ball or cause a trip hazard fixing if necessary. After the walk around is complete, we dust mop the floor. We then use a water and vinegar solution to clean the floor. The court is then ready for the Bayhawks to practice. On game days, the court is constantly dust mopped to make sure it is safe for the players. 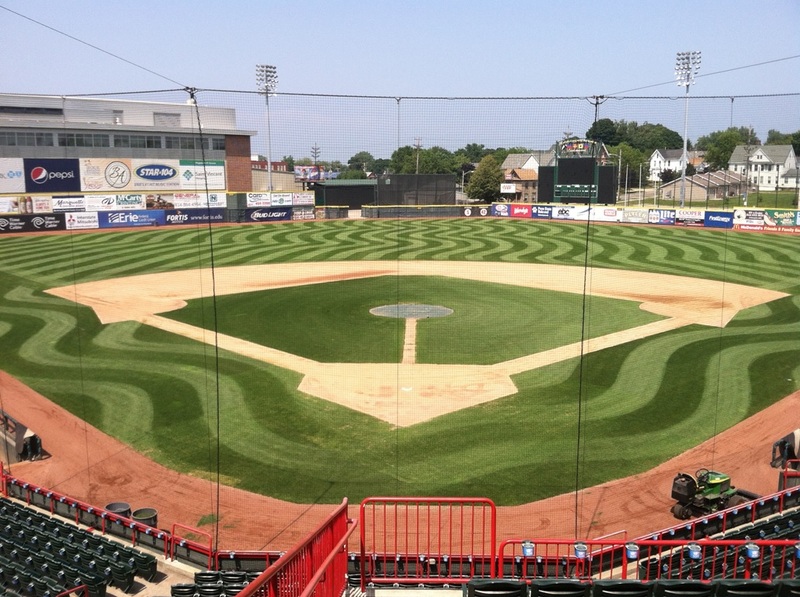 We are 182 days away from the start of the 21st season of Seawolves Baseball at Jerry Uht Park. See you April 9th.